Without meeting minutes it is as if a condo board meeting never took place. Without meeting minutes there is no record of what was said, by whom or what decisions were made. Decisions or actions taken by the Board can be questioned by any owner or resident who wishes to do so. Without meeting minutes there may be no way for a Board to defend itself in court should they be required to do so. Clearly, this is an undesirable and easily avoidable situation. Minutes are an integral part of due process and transparency, and are recognized by the Condo Act which requires that condo corporations maintain a minute book. This serves to protect the board, management and residents. Minutes are the written record of an official proceeding. It is a record kept by courts and corporations for future reference. They are intended to serve as a brief, concise summary of the business transacted at the meeting and decisions taken by those in attendance. Minutes are intended to provide a fair and unbiased record of decisions. They are not intended to reflect personal opinions or agendas. When properly maintained, minutes show how condo assets are managed and how condo fees are spent. They document the financial position of the corporation and decisions that affect residents. Minutes are legal documents used by legal authorities, auditors, tax authorities and others as representation of actions by the Board. They are not intended to reflect political positions of a board or its directors. They are not a comprehensive account of everything said or discussed at a meeting. Meeting minutes are admissible in court. When minutes are taken by an independent third party, the accuracy and reliability of minutes may be viewed as more reliable. When minutes are altered, perhaps due to unintentionally omitted information, an original set of minutes should be retained by the Secretary. When minutes are altered, a good practice is to retain all versions and to notate altered minutes so that revisions are easily determined. At a Board meeting, the Secretary is responsible for ensuring minutes are taken. 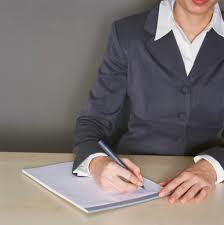 The task may be assigned to the condominium manager, recording secretary or a professional minute taker. 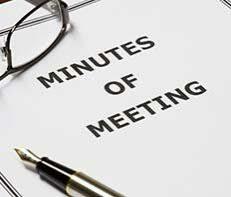 The minute-taker should be provided with all meeting materials provided to meeting attendees several days in advance of the meeting. Material distributed at a meeting should also be provided to the minute-taker. Decisions involving money should be recorded in the minutes along with information reflecting the financial standing of the condo corporation. This may include projects for tender. Minutes should include matters involving receipt of condo fees and spending of operational or reserve funds. Decisions made at a Board meeting should be identified in the minutes. Where a decision has not been made, minutes should identify further action required so that the Board can come to a decision. Director votes are recorded in minutes as a way to show how the Board came to make decisions in a reasonable manner. Matters not involving a decision are generally not recorded in minutes. Differing opinions among directors or general discussions are also not recorded in minutes. Signed minutes of all meetings. Reports tabled at each meeting inclusive of management report, financial report, committee meeting minutes, and reports submitted by individual directors. Annual General Meeting (AGM) minutes along with the auditor’s report and reports provided at the meeting. This may include any report by the president, treasurer, a director or committee. In-camera or confidential minutes regarding owners, staff or other information not deemed suitable for public disclosure. Draft minutes should be approved no later than at the following board meeting after which owners should be informed that minutes are available. Best practice is for draft minutes be provided to board members no later than 48 hours after a meeting ends. Directors should commit to review and respond to draft minutes within 48 hours. This makes meeting minutes available 5-7 days after each meeting. One practice adopted by some condo boards is to provide owners with access to a summary version of minutes in place of official minutes. Where this is done, owners have no confidence that information provided to them is complete. It can facilitate miscommunication, misunderstandings and the spreading of rumour, all of which should be avoided. There is no way for owners to know how this information is being filtered or for what purpose. Minutes are an official record that should not be modified or include redactions when provided to owners. Public posting and distribution of minutes is not a requirement. It is strongly recommended. Minutes are not intended for use as a communication vehicle. Yet, given the nature of condo corporations and their boards, using minutes as a primary communication vehicle provides considerable value to the entire condo corporation. Minutes can be posted online for access by owners or distributed by e-mail. They can be posted on a bulletin board. Providing access to minutes through postings and electronic distribution keeps owners and residents informed. It stimulates discussion and provides transparency. Failure to prepare minutes in an unbiased and complete manner, and failing to make them readily available, is the likely cause of many resident-board-management conflicts. Greater attention to the preparation and quality of meeting minutes provides many benefits with no downside to transparent and credible condo boards.